I brought this lovely lady home last week. I don't have many miles on her yet, but from what little I have ridden I can already tell that I am going to have many miles of fun on this bike. I have a laundry list of aftermarket goodies set to go on in the coming weeks and I am looking forward to the progression of that build. Stay tuned for more updates. Reactions: Wallygator and Christian P.
Will do! Once the exhaust goes on and I change out a few more bits I will have already dropped 10+ pounds off of the bike. It's really smooth on road and I think the front end is better than the KTM 500 and Husky 501 I was also considering. I think the full FMF exhaust and Vortex ECU will really wake it up and pull out a lot of the potential hidden in this engine. I am already confident that I made the right choice with this bike and I haven't even put 100 miles on it yet lol. Very nice! In for where you take this. It seems to be a great platform with it's only limitation being weight. The KTM's are all about minimal weight but I feel they will require a lot more maintenance than the Honda. 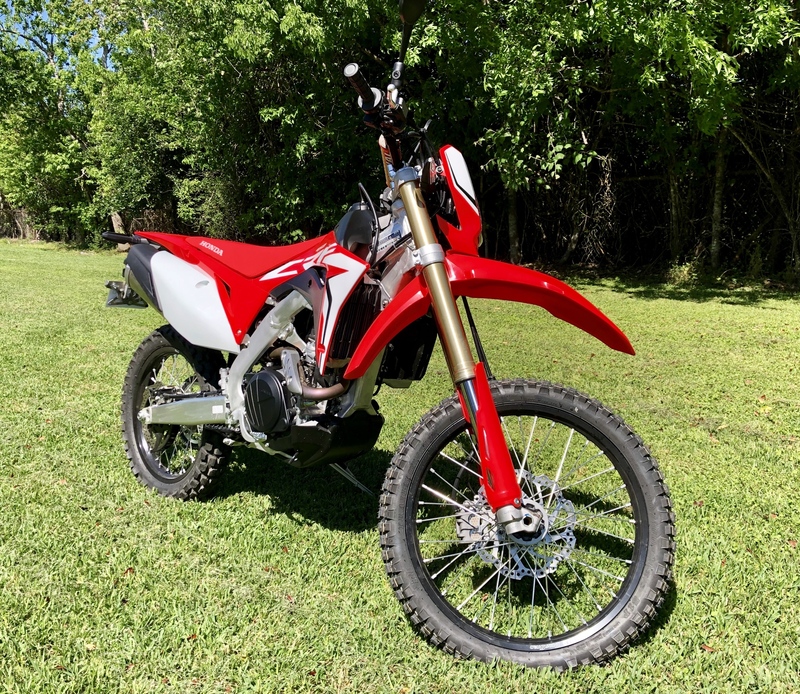 I priced a KTM 500 EXC at the dealer a few days ago and they wanted $12,227 out the door... ...then would need accessories like skid plate, radiator guards, etc...just crazy expensive, but the best performance. Worth thousands more than the Honda...I don't think so. Hondas are reliable (hence the weight) and I expect this bike to be no different. Look forward to more of this build. My most recent small bike was a KTM 300 2T. I was leaning heavily towards the KTM 500 EXC and Husky TE501 prior to considering the 450L. 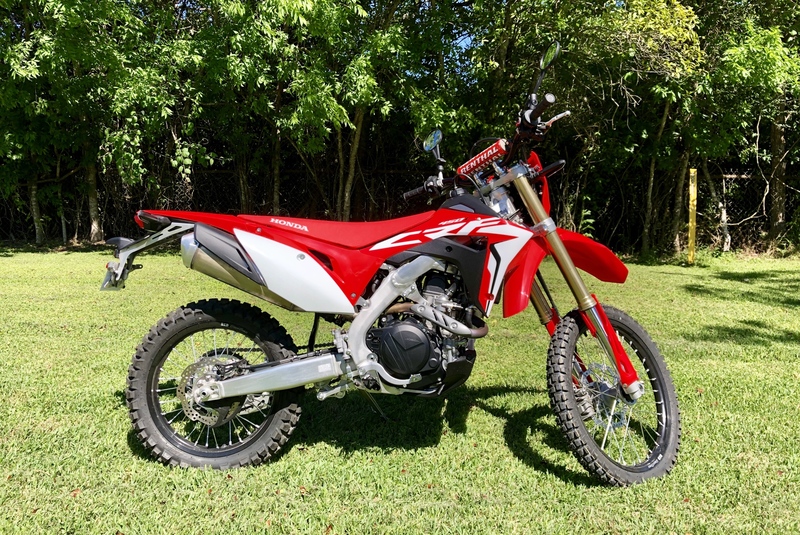 The fact that this bike is better on road and I have a local dealer network played a large factor in my decision to buy Red this time. I paid $9600 OTD so it was less to swallow than the KTM or Husky pricing, but I feel they are still over priced. I have a Seat Concepts Comfort Low seat and Zeta Pro Armor Full Wrap hand guards arriving here later this week. I am looking at pulling the trigger on some GoldenTyre rubber tonight too (GT216AA 90/100x21 Fatty up front and a GT333 120/11x18 out back), the factory stuff is garbage off-road. The front end on this bike feels better than the 500 I rode, but it needs a little tweaking in the compression, it's a tad sharp still. I will definitely be keeping this thread/build updated here for you all. I snapped this pic just prior to being chased off of this local grass/turf farm lol. Thanks for the info- I have also been comparing Hus/Ktm in comparison to this bike. I really wanted the Honda, but not big enough of a leap from my 15 year old modified DRZS. 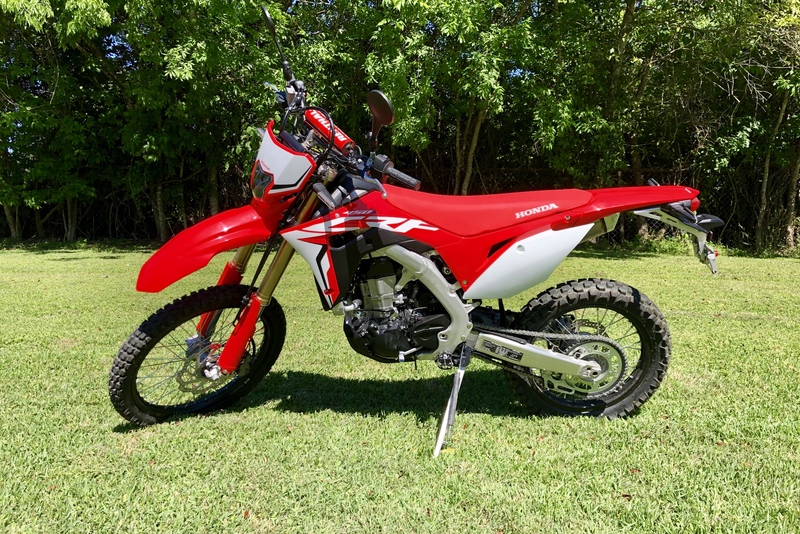 That $10,300 sticker price sealed the deal for me, FE 450. 2018 OTD $11,000. After 1,000 miles, 800 of it single-track, I made the right decision. So much, I got her a sister, 19' TE 250i. 500 miles of single-track on her. Both have only costed me in gas and oil so far. Reliability on both on the forums/facebook groups are thumbs up for those that haven't dickered with them. If I'm paying this much money, and as all 3 are near the same price, I'm buying the one that is the lightest and most powerful. The side benefit was the dealer, only KTM and Husky, even though in OR, treated me like part of the family. KTM mom-n-pop dealer near my house is where I go for supplies is so cool, shim one-for-one swaps at no cost. Never would get that at a normal dealership! Very interested to see how light you get your L down to. I've already dropped 10lbs and there's likely a few more to go. With the 450L there's a 26-27lb weight difference between it and the KTM 500 and 21-22lb between it and the Husky when all are fully wet. 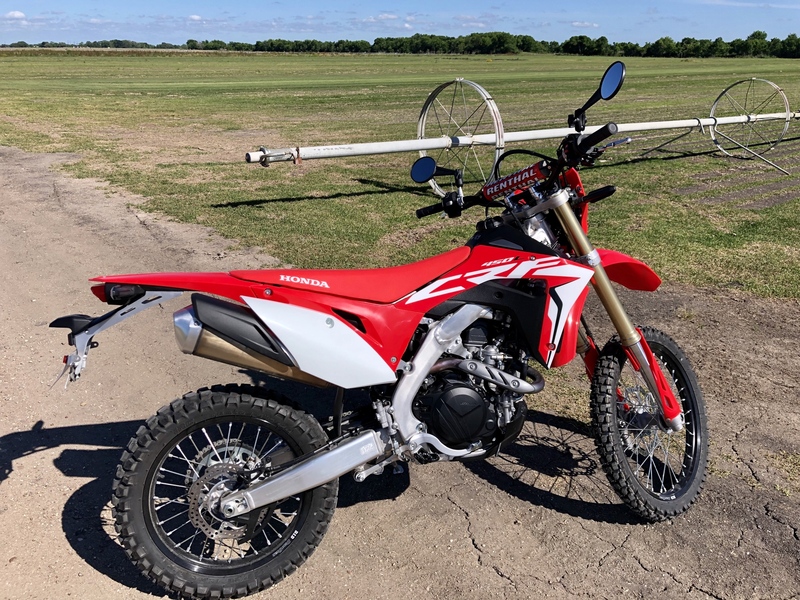 After my full FMF exhaust and Vortex ECU the power will be negligible if any difference at all and the Honda is far and away the better bike when on the pavement and at speed and I found the suspension better out of the box, it has a stronger sub frame as well. I have had two KTM's in the past, they are fantastic bikes, but they aren't perfect, I always had to wait weeks for parts, smaller dealer network, more maintenance, and obviously more money all around. I had a Husberg a few years back (570) and I loved that bike but I got talked out of it. This was obviously prior to the Husky merger but now that they are one in the same I feel like I have kinda tasted that flavor as well. I was leaning Husky 501 if I didn't buy the Honda but I got the Honda for $9600 OTD, only fools pay retail. I'm not gonna lie, dealer network played a large roll in my decision, the closest KTM and Husky dealer is over an hour and a half away and in the middle of a large city. Even as silly as this might sound, I also wanted to try something new, everyone buys Orange when it comes to an Enduro or woods bike and for good reason, they've had that market locked down for a while now, but I wanted to be different and try the new flavor, it's nice to see a Honda back in the garage after all of these years. At the end of the day all of these bikes are excellent choices and 99% of us will never be able to ride them to their full potential so the few horses here, the few pounds there, some more expensive parts over there, etc. really don't matter. Buy what you like and what moves you and get out there and enjoy it. I am hoping that this ends up being a long term bike, I usually keep my two-wheeled machines around a lot longer than my autos lol. But if for whatever reason the bike ends up not being what I expected/wanted/needed then it'll likely go up on the chopping block in favor of a KTM 500 or Husky 501.